We arrived in Ullapool at lunchtime, a town that most knew nothing about save that it was once a thriving fishing port. After a couple of nights in a Thurso hotel where many guests had a pretty poor accommodation experience, the mood on the tour wasn’t the happiest. Our tour director tried to placate the guests by promising a lunch stop surprise that people would be delighted with. We were ushered into The Seaforth on Ullapool’s harbour front and first impression was that it’s a decidedly unfancy pub. So, is this the place that was supposed to surprise us and erase all memories of Thurso? Tables had been reserved for us but you had to go to the bar and stand in line to order your food. With the surge in the number of diners, fish and chips seemed like the best bet or we could possibly be waiting a long time for anything fancy. Tony ordered haddock and chips for us and his favourite brew. In a couple of minutes the drinks arrived and not long after the fish and chips arrived. We were all quite impressed by the speed at which the kitchen managed to get all the orders out in spite of it being busy. Even more surprising, the fish was very fresh and perfectly cooked. The fish batter and chips were not greasy and the portion was quite generous. The cost was £9.95 for the fish and chips and it was the best meal we’ve had on the tour. Our fellow travellers were in agreement and smiles were restored to people’s faces. Squid, mussels, lobster, scallops, crabs and other specials are on The Seaforth’s menu and no doubt the seafood are landed from the boats at the pier. There’s a restaurant upstairs as well as a takeaway section called The Chippy. 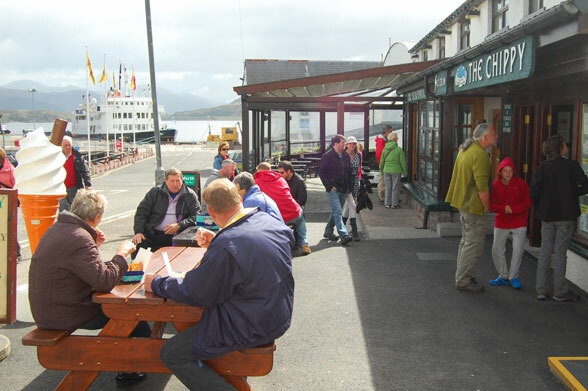 The Seaforth overlooks Ullapool harbour and if you’re holidaying in the Highlands of Scotland and travelling in the vicinity of Ullapool, The Seaforth is certainly worthwhile making a stop at. Ullapool is approximately 55 miles north- west of Inverness on the A835.